It is our duty as humans to look after what nature has given us. Instead of abusing it why not embrace the Power of Nature. We all have a part to play….. Together we hope to build a GREENER future! Installation of Air co-saver units for energy saving and installed Green wise management system for monitoring purpose. Installation & Commissioning of 42 m Wind Mast at Pwani Oil Ltd, Kikambala to carry out wind studies since Sept, 2009. Provide consulting services and energy assessment to verify feasibility of turbine installation.. Installation & Commissioning of 50 m Wind Mast at Mombasa Cement Ltd, Kikambala to carry out wind studies since Sept, 2009. 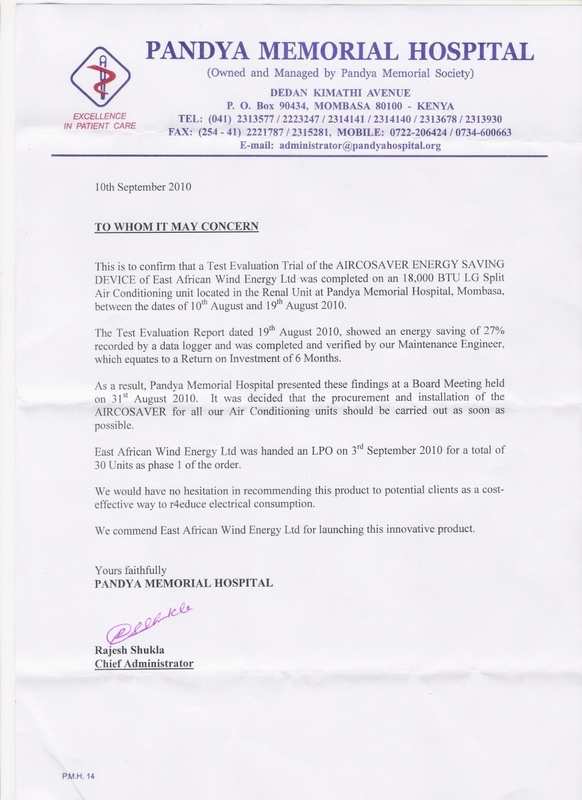 Provide consulting services and energy assessment to verify feasibility of turbine installation..
Supply of 30 Aircosaver units to Pandya Memorial Hospital after successful trial evaluation that gives them 27% savings. Installation and commissioning of 15 Aircosaver units in Southern Cross Safaris after a successful evaluation that presents 22% savings. Signed MoU with UK Consortium for 100 MW wind farm project in Tanzania. Site has been selected and wind data to be correlated. Presently conducting feasibility studies for the project. Negotiating with various land owners in the region for further sustainable energy projects. If you’re interested in taking control of your power consumption, please take a minute to contact us so we can show you what options are available. It is possible to begin reducing your energy consumption and your carbon footprint while increasing your bottom line. There is no obligation to find out, so call us today. SUPPLY OF WIND TURBINES AND OTHER RENEWABLE ENERGY TECHNOLOGY INCLUDING INSTALLATION AND COMMISSIONING. PROVIDE CONSULTING/ ADVISE TO CLIENTS FOR SOLUTIONS. SOURCING THE RIGHT SOLUTIONS FOR OUR CLIENTS. EAWEL partners with Amplex, Denmark to provide Smart Grid and Energy Management solutions to the region. Official Aircosaver product launch expected by end of October & to appoint national & regional distributors for this product over the next month.. Copyright (c) EAWEL. All rights reserved.